Eutrophic temporary pond near Palermo, Italy; summer 2006. Rossella Barone (rossella.barone@unipa.it). © Rossella Barone (rossella.barone@unipa.it). Published in: Korshikov, A. (1924). Protistologische Beobachtungen. I Cyanophora paradoxa n. g. et sp. Russ. Arch. Protistol. 3: 57-74. This is the type species (holotype) of the genus Cyanophora. Type locality: Bezirk Charkow (Silva 1996-to date). Lectotype: Korshikov 1924: 3, pl. III, fig. 1: resin-embedded cells of strain CCAP 981/1, deposited as TNS-AL-57397 in TNS; epitype locality: near Cambridge, England (Pringsheim 1958) (epitype) (Takahashi et al. 2014: 1065). Notes: "Lectotype [?] locality: Belopolye, Russian Empire (now Bilopillia, Ukraine) or near Kharkov Oblast, Russian Empire or USRR (now Kharkiv Oblast, Ukraine)." (Takahashi et al., 2014: 1065). Accesses: This record has been accessed by users 4134 times since it was created. Barone, R., Marrone, F. & Naselli Flores, L. (2006). First record of Cyanophora paradoxa (Glaucocystophyta) in Italy. Naturalista Siciliana, ser. IV 30: 97-106. Chapman, D.J. (1966). The pigments of the symbiotic algae (cyanomes) of Cyanophora paradoxa and Glaucocystis nostochinearum and two Rhodophyceae, Porphyridium aerugineum and Asterocytis ramosa. Archiv für Mikrobiologie 55: 17-25. Hall, W.T. & Claus, G. (1963). 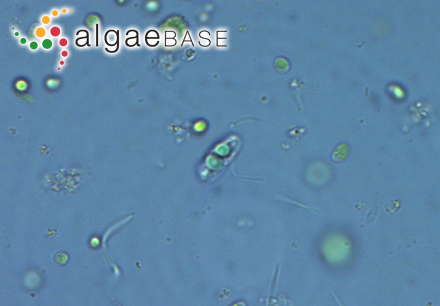 Ultrastructural studies on the blue-green algal symbiont in Cyanophora paradoxa Korschikoff. Journal of Cell Biology 19: 551-563. Hawthornthwaite, A.M., Codd, G.A., Mangeney, E. & Gibbs, S.P. (1987). Compartmentation of Calvin Cycle enzymes in photosynthetic prokaryotes and the cyanelles of Cyanophora paradoxa and Glaucocystis notochinearum. British Phycological Journal 22: 305. Iino, M. & Hashimoto, H. (2003). Intermediate features of cyanelle division of Cyanophora paradoxa (Glaucocystophyta) between cyanobacterial and plastid division. Journal of Phycology 39: 561-569. Korshikov, A. (1924). Protistologische Beobachtungen. I Cyanophora paradoxa n. g. et sp. Russ. Arch. Protistol. 3: 57-74. Sato, M., Nishikawa, T., Yamazaki, T. & Kawano, S. (2005). 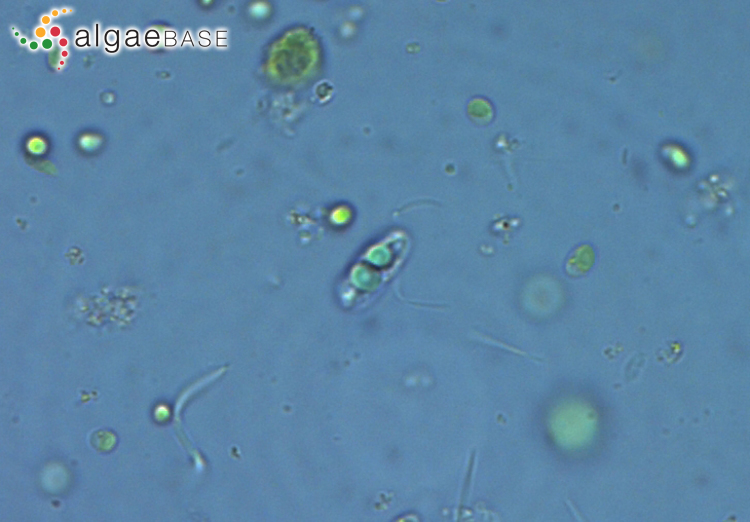 Isolation of the plastid FtsZ gene from Cyanophora paradoxa (Glaucocystophyceae, Glaucocystophyta). Phycological Research 53(2): 93-96.